Some random gamer asks President Obama to reconsider his stance on Devil May Cry. We all enjoyed the humorous White House petition for the construction of a Death Star, and had a good chuckle at the ambitious citizen who wants 3D Doritos so badly that they felt it was worthy of the President's attention, but asking the most powerful man in the country to pull a game from store shelves simply because you don't like it? That's a whole new level of obnoxious. 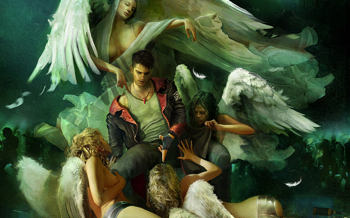 A new We The People petition is asking just that, and hoping that the U.S. government will step in to yank DmC: Devil May Cry from retailers nationwide. "Dear Mr. Obama: As a consumer to the Video Game Industry there is one Video Game that has caused a lot of controversy over the past few month's. Please Mr. Obama, look into your heart and make the decision that will please us Gamers." Now, ignoring that the grammar of the request suggests it was typed by a 5th grader, let's all take a moment to appreciate the absurdity of the request. Is it a joke? I honestly can't tell. It's worded in such a way that the person who wrote it - one "R.J." from Franklin, Vermont - really seems to believe that the quality of the game is somehow a violation of human rights. At best, it's a poorly worded joke that fell flat, but there's the possibility that a certain segment of the gaming populous believes not only that the petition will reach the required 100,000 signatures to warrant an official response, but also that the reboot of a video game franchise directly impacts their quality of life. Whatever the case, this is officially a new low. Update: The petition has been pulled from the website. Huzzah!